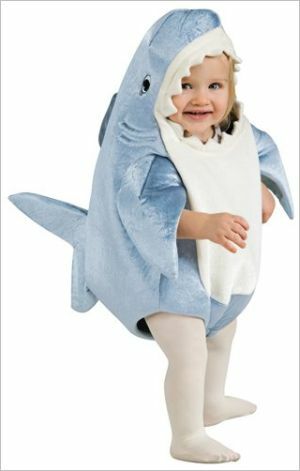 A toddler shark costume is always a fun dress up item, and makes a unique and exciting Halloween costume for your little one. After all, who wouldn’t like to have a great big mouth full of teeth and go somersaulting in the wide blue sea? A shark costume is also a good choice because, though your little guy will likely be the only shark out in your neighborhood this Halloween (unless you neighborhood is particularly shark-friendly, in which case all bets are off) it is still a popular enough choice there are a variety of options in quality costumes to buy. For instance, if you want a fat, short little shark, Rubie’s Deluxe Shark Romper Costume is one way to go. This is a one-piece costume, meant to be worn over white pants or tights (your child’s legs will then make the tail). With flippers, fins, and white teeth for a wide open mouth (your child’s face peeks out from the whale’s throat) this will make a very convincing shark costume for a toddler. The snap closure at the crotch means it’s easy to do diaper changes, if your toddler is still in diapers, or for him to use the potty (with a little help buttoning up afterwards). You can wash this costume, but not in the machine. 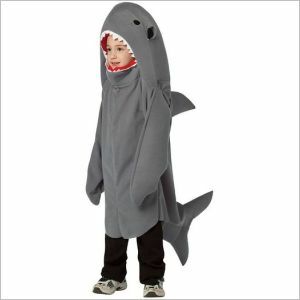 Would you rather have a full length costume for your toddler, to make him into a long lean and hungry shark? You could do the Rasta Imposter Shark; a scary looking grey shark that has nefarious looking eyes and a big shark mouth to look out of. This costumes consists of a pretty simple grey tunic, but, considering its simplicity, it is quite effective. The one-piece design makes it easy for your toddler to get dressed: no fussing with extra headpieces, flippers, or feet. If it’s cold where you are, you can have him wear a sweat suit underneath if it’s fairly warm, go with something light. 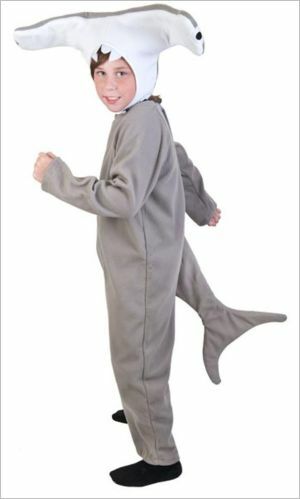 Then you could also go with something really distinctive: a hammerhead, say the Wilton Child Hammerhead Shark costume fits an older toddler—sizes start at 4T—and if your little guy or girl is enough into marine biology to know the difference between different types of sharks, he or she may appreciate having a costume which reflects that. This shark costume is even longer than the Rasta Imposter Shark; a full length jumpsuit rather than a tunic. The distinctive features are the white and grey hammerhead and the forked tail; both might be a little floppy out of the box, but when stuffed they should stand out nicely. Your toddler will be very impressed with himself (or herself) when he or she puts this toddler shark costume on and looks in the mirror; and you may have to make your supermarket trips with a shark in tow for a long while.